Subsequently commissioned by the Royal Navy as H.M.S. Caledonia. – Caught fire and later scrapped. Remarkably, the Atlantic liner that was the largest moving object in the world from her launch on June 20, 1914 through October 29, 1932, when the French liner Normandie was launched, never made a voyage under her original name. Originally built for the Hamburg-Amerika Line by the Blohm & Voss shipyard, the Bismarck was six feet longer than her sister Vaterland. But only about a month after her launch, the Great War (now known as World War I), broke out. Work on her fitting out slowed and eventually stopped; she was laid up, incomplete and decaying, throughout the war. Following the Armistice, Bismarck was handed over to the Allies as part of war reparations. 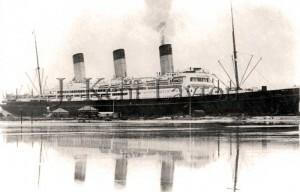 In the end, the White Star Line purchased her and renamed her the Majestic. In taking on this new name, she became the second ship of the title to serve in White Star’s ranks; the first Majestic, sister of the Teutonic, entered their service in 1890. The behemoth liner was completed at the Blohm & Voss yards to White Star’s specifications, although it was clear that the Germans were not particularly happy about losing their greatest accomplishment to the British. 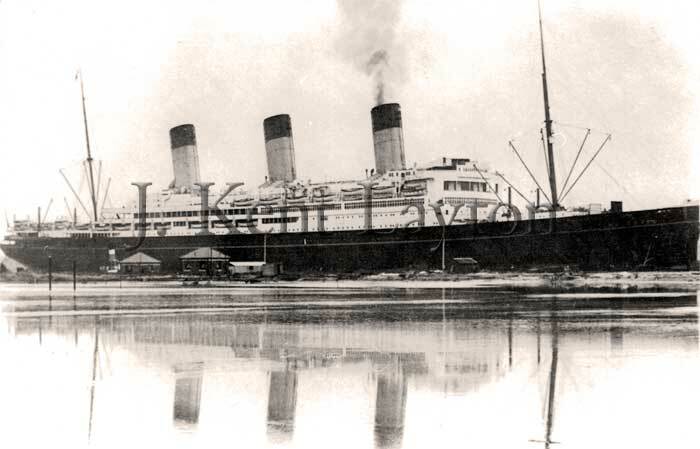 In the end, when White Star arrived to formally take possession of the ship, they found her painted in HAPAG colors, and under her original name and registry, along with a few other surprises. The ship left Hamburg for a very brief set of trials on March 28, 1922. After successfully passing these tests, some more work to complete her was carried out, and she arrived in Southampton on April 10, 1922, now under White Star’s colors, and with her new name emblazoned on her prow. Following a month of preparations for her maiden voyage – nearly eight years from the time of her launch at Blohm & Voss – she left on her maiden voyage on May 10, 1922. Once again, the White Star Line had the largest liner in the world in their stables. For the remainder of her career, the Majestic proved to be a much-loved and popular vessel. She was laid up in early 1936, eventually being sold to the Royal Navy to serve as the training ship H.M.S. Caledonia. In September of 1939, she caught fire and sank; she was finally scrapped, her steel being recycled for the war effort. With an extensive collection of archive pictures of the Majestic and other ships, including photographs of the White Star vessel’s stately rooms, and striking paintings of the ship in vibrant colour, as well as a fascinating and comprehensive narrative chronicling the life of the vessel, RMS Majestic: The ‘Magic-Stick’ provides a complete history of a ship that was once the pride of the White Star Line. You should also make sure to check out my own book, The Edwardian Superliners: A Trio of Trios, which has a full chapter on the history of the Majestic. The Leviathan (left), Majestic (center) and Berengaria (right) together in Southampton during the twenties. Sketch ©2004/2005 by Chris Mazzella. Not for re-use without permission. This White Star Line ad from 1925 features their flagship, the R.M.S. Majestic, the former HAPAG liner Bismarck. She was, at that time, the largest vessel in the world. ~ Author’s Collection. A rare aerial view of the Majestic. ~ Mark Chirnside Collection. These three illustrations are rarities, especially for their colorized nature. Above is a depiction of the ship’s a la carte restaurant. ~ Mark Chirnside Collection. This illustration shows the First Class Dining Saloon of the Majestic in all its splendor ~ Mark Chirnside Collection. Like her sisters, the Majestic had a Pompeiian Swimming Pool, seen here in full color. ~ Mark Chirnside Collection.